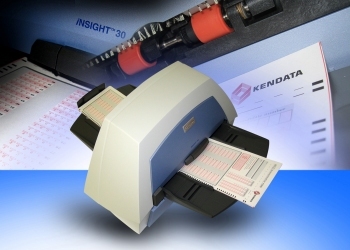 The latest addition to Kendata Peripherals’ range of scanners is the versatile iNSIGHT 30 machine from Scantron, which has been designed to enable existing users of OMR (optical mark recognition) technology to easily migrate to document imaging whenever they choose. By combining the speed and accuracy of OMR with high-quality full-colour document imaging facilities, the iNSIGHT 30 offers a future-proof solution and eliminates a potentially wasted investment in a dedicated OMR machine. In data collection mode, the scanner reads traditional OMR marks and bar codes and converts this information into ASCII data, achieving a throughput rate of up to 3600 sheets per hour. The machine will read both pen and pencil marks, and forms can range in size from 63.5 x 139.7mm to 228.6 x 355.6mm. The pick-up rollers of the iNSIGHT 30 are made from a special rubber compound that is designed to stay clean when processing pencil-marked forms. This is important because it prevents the transfer of pencil marks from one form to the next - a problem that can affect data accuracy with other machines when pencil smudges are incorrectly interpreted as intentional marks. In document imaging mode, the iNSIGHT 30 scans paper documents as either TIFF or JPEG images, and these can be converted to PDF or RTF formats using the bundled ScanTools Plus software. The machine features particularly low scan	heads, which prevent paper curl, minimise distortion and ensure that each image is as accurate as possible a representation of the original document. Output resolution is user selectable from 75 to 1200dpi, and throughput is as high as 75 pages per minute. The scanner can handle sheets of multiple sizes and thickness in a single batch, ranging from small card stock to long print-outs. When using the ScanTools Plus software, the iNSIGHT 30 is able to capture – in a single pass - all the OMR data on a form, together with an image of the page. In addition to ScanTools	Plus, the iNSIGHT 30 is supplied complete with Click&Scan software and a TWAIN driver, which enables it to be used with a variety of other standard software packages. The scanner is compatible with Windows XP and Vista operating systems and is equipped with a USB 2.0 interface.